Highlights from the Public Participation meeting 7/30/09 at the Lion's Hall. The meeting started at 7:30PM with Jeff Retzlaff as meeting administrator. Jeff provided handouts specific to our town and we split into groups of 5 or 6 people to each table where we discussed questions on the handouts and came to a consensus of opinion that we all shared with the entire room full of people for discussion. Unfortunately, the turnout was light, however, Jeff told us that out of the 380 or so surveys sent out in late July approximately 100 have been returned to date. We shared our opinions on S.W.O.T. We discussed some thoughts on where we may be headed as a town. To see the presentation that Jeff provided, download either one of these files and review the information. This show is well worth your time! There are a number of interesting facts regarding our town and our future. I recommend that you right click and use "Save target as" or "Save link as" and download the entire file to your machine before viewing the show. 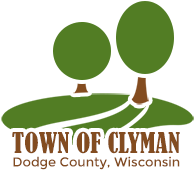 Town of Clyman residents were mailed a survey in July of 2009 to express their thoughts about our town's future. These and other tabulations were discussed at length during the Planning Advisory Committee meeting of Sept 24, 2009.